Dhaka – Bangladeshi Prime Minister Sheikh Hasina and her Canadian counterpart Justin Trudeau have called the global community to work together to curb terrorism. They made the call as Trudeau make a phone call to Hasina Monday to denounce the terrorist attacks on two Christchurch mosques in New Zealand, Prime Minister’s press secretary Ihsanul Karim told reporters in Dhaka. 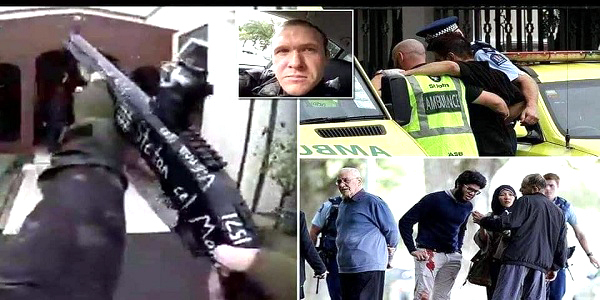 At least four Bangladeshi expats were among the 50 people killed in the attack carried out by a white supremacist on Friday. The two ministers talked for nearly 20 minutes by phone. The press secretary said Trudeau expressed concern over the safety of Bangladesh national cricket team which narrowly escaped the Friday’s attack. The Canadian prime minister expressed relief that members of Bangladesh cricket team remained safe, the press secretary said. Justin Trudeau offered deep condolences at the loss of lives of 50 people including Bangladeshis in the New Zealand twin mosques attack. 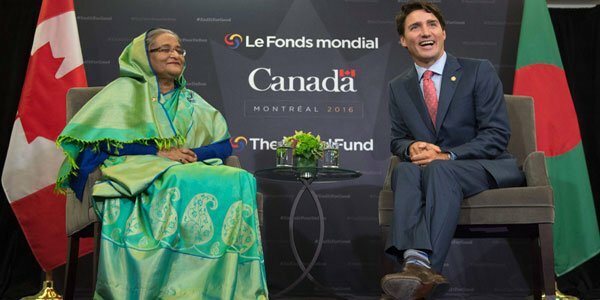 Sheikh Hasina told Justin Trudeau that there is a need for raising a global movement against terrorism. In response, said the press secretary, the Canadian prime minister supported the view of Prime Minister Sheikh Hasina and said the world community should act together to uproot terrorism. Reiterating her government’s “zero tolerance” policy against terrorism, Hasina said Bangladesh denounces terrorism in all its forms and manifestations. “Bangladesh is a land of peace and communal harmony and we’ve asked the law enforcement agencies to keep strong vigil and protect all places of worship including mosques, temples, churches and pagodas,” Hasina was quoted to have said by the press secretary. Islam does not allow terrorism in any forms and the terrorists have no religion and boundary. The premier told Trudeau that Bangladesh government has taken concerted efforts for ensuring safety and security of the people and rooting out terrorism from the society. Hasina renewed her call to extradite the Bangabandhu’s self-confessed killer Noor Chowdhury who is now staying in Canada. “Noor Chowdhury is presently fleeing justice and now staying in Canada. It would be great services to the rule of law if Canada hands over the killer to Bangladesh,” she said. In response, the Canadian prime minister said that it is a legal matter and “we will look into it”. Hasina expressed firm optimism that Bangladesh and Canada will remain further engaged in mutually cooperative, supportive and respectful partners in the journey towards further development and progress. 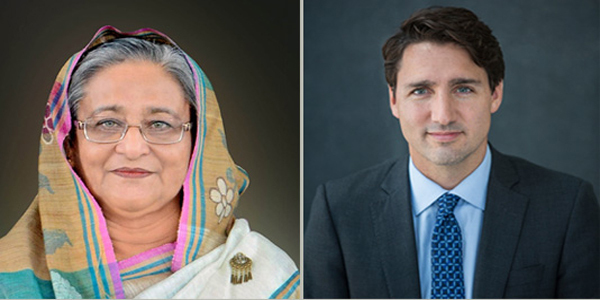 Hasina invited Justin Trudeau to visit Bangladesh and wished his success in the upcoming Canadian polls. Justin Trudeau greeted Hasina on her party’s landslide victory in the last general elections and her assumption of office as the prime minister for the fourth time, according to state-run news agency Bangladesh Sangbad Sangstha.